Riab was born Boris Riabouchinsky in Moscow, Russia on 1 November 1898. His family was fairly well off, and he was able to study at several art schools in Moscow. After the Bolshevik Party gained power in 1917, he along with his family fled Russia. He traveled throughout the world pursuing hunting and sport until settling in France in 1927, when he changed his last name to Riab. He painted hunting dog portraits and wild fowl, mostly in watercolor. 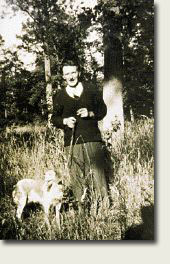 Examples of his work include: Pointer in a Landscape; Five Cocker Spaniel Puppies; "Memour", study of a German Shepherd; and Greenwing Teal. He also printed limited edition engravings of studies of setters, spaniels, retrievers, ducks, pheasants, pointers, partridges, snipes, and woodcocks.